We are a nurse-owned and operated company. Why do we want you to know that? Because nurse-owned and operated companies are operated by a nurse and a nurse has knowledge of healthcare. You should want a company who understands elders’ needs and what it takes to provide a service that is not only necessary, but compassionate. A nurse knows about compassion. 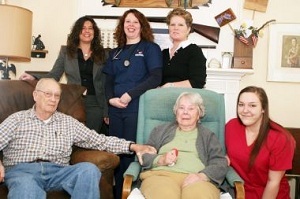 "Aging At Home, Inc." was created with the intention of being different from other homecare companies. Our mission is to enable elders to remain at home for as long as possible because that is where we know they thrive. Our services are provided in a client friendly manner; meaning we don't require more than 24hours notice to change or cancel services for any reason. It is also our goal to be an employee friendly company because we know if our employees are happy working for us they will be happier and provide a higher quality service to our clients. A service with dignity, respect and compassion in mind. "Aging At Home, Inc." also targets the "hard to reach areas" where other companies fail to service. How do we do that? We recruit and we also have the ability to offer Certified Home Health Aide and Personal Care Homemaker training to individuals. As nurses, we have the ability to train individuals and provide our clients with caregivers wherever and whenever they are in need. Our employees are all certified workers that is, certified as home health aides and some are even certified nurse’s aides as well. By certified, we don’t just mean they have a piece of paper saying they are certified. They all have completed the minimum 75 hours of training as outlined by the State of Massachusetts, which includes a minimum of 17 hours of skills training. After all, that is what is most important, that they have been taught all of the skills necessary to carefully and confidently care for our clients.